The risks of working in extreme temperatures are well known and yet, every year, dozens of workers in North America die, and thousands more become seriously ill from working, without effective safety measures, in the heat. When a person works in a hot environment, the body must get rid of excess heat to maintain a stable internal temperature. This is normally accomplished through sweating, however, when the air is warm and the humidity is too high then the sweat produced cannot evaporate. When this happens, the body cannot get rid of excess heat and it starts to store it. This raises the bodies internal temperature and the heart rate increases. If this process continues unchecked, the individual may become irritable or sick, may become confused and often loses the desire to drink. This is can then be followed by fainting and possibly death, if the body cannot be cooled down. This is “Heat Stroke”, the most serious form of heat related illness. Heat stroke is a medical emergency that may result in death! Call 911 immediately! Under occupational health and safety regulation, employers are responsible for protecting their workers from hazards in the workplace. That means ensuring workers are made aware of the risks and trained to recognize the symptoms of heat exposure and how to deal with them. It means ensuring workers are provided with water, rest and shelter from the heat and given time to gradually increase workloads and take more frequent breaks to give them time to acclimatize and, it means having emergency plans in place and training personnel on ways to prevent the effects of heat stress. The “Heat Index” can be a useful tool to help companies and workers plan their work day to beat the heat. 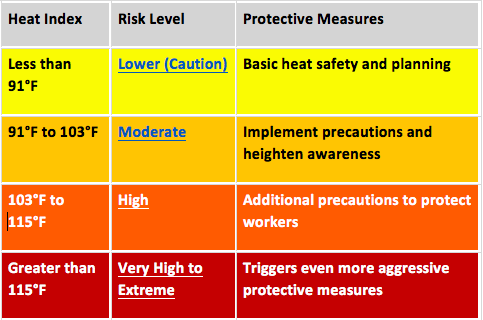 In the age of digital information, OSHA has created a free, Heat Safety Tool app, for digital devices like smartphones, that can provide workers with information regarding the heat index specific to their area as well as guidance on the signs and symptoms of the various kinds of heat stress and measures that should be taken to address them. The OSHA-NIOSH Heat Safety Tool is a free and useful resource for planning outdoor work activities based on how hot it feels throughout the day. It features real-time heat index and hourly forecasts, specific to your location, as well as occupational safety and health recommendations from OSHA and NIOSH. An ounce of prevention, “Water. Rest. Shade”, can be enough to make sure that our workers thrive in the “Dog Days of Summer”!